Sometimes names do matter. The only reason I listened to BC and Sam when they showed up in my inbox was because I know another pair of humans named BC and Sam, but it seemed unlikely that they would contact me by e-mail, and that both of their names would be in the e-mail. But then I realized it was from a certain entity that often sends me music to preview. Until that point, I had genuinely detested every single artist they sent me, so I only clicked on the link for my person education. I mean, BC and Sam? What is that? Two drunk Texans with guitars? Fortunately, I was pleasantly surprised. Bc and Sam remind me of the Indigo Girls. It's not their sound -- though singer Samantha Thoe-Schechter's voice does bear a resemblance to Emily Saliers'. It's the pure perfection in the way she and renowned guitarist Brian Cutler work as a unit. It really is breathtaking, and more interesting than the music itself. Considering the songs are entirely original compositions about love loss, the Civil War, and prison yards that could have been written in your great-great-grandpappy's time, that says a lot. 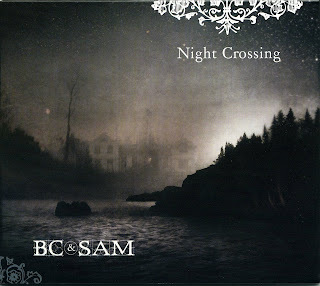 You can't help but lose yourself in Night Crossing. It's absolutely a testament to the power of good songwriting. More importantly, it's a reminder of how rare and gorgeous good teamwork is.